The bitter confrontation between Saudi Arabia and Iran is not only stoking conflicts in Syria, Iraq and Yemen, but now threatens the stability, security and well-being of the whole Gulf region. All the major global powers have significant interests in this area, and the pursuit of these interests adds further layers of division and conflict. This book goes to the heart of this issue, examining the critical modalities whereby the "Gulf Cold War" can be brought to an end. 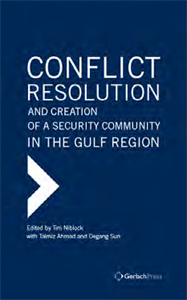 What is needed, the contributors argue, is the creation of a security community among the states of the Gulf. The processes through which this could be achieved are carefully examined. All those interested in the future and well-being of the Gulf region should give consideration to the perspectives advanced. Center Cambridge in summer 2016.